I thought the Boston bombings might be a good example to explore how BFST could be applied. I collected as much information as I could about the case from multiple media outlets. I also conducted my own independent research to learn facts that the media a) was too busy to explore (they have to report the 'facts' as quickly as possible after they happen or b) decided to leave out of their reporting for privacy reasons. I firmly believe that this latter explanation is out of the question as our society is so fascinated with exploring the minutia of almost any situation and sensationalizing it. The result of my 'project' led me to understand that a) BFST provides a great lens to explore and try to understand the behaviors of the characters directly or indirectly involved in the case, and b) the Boston bombing case is a teaching tool to demonstrate how most if not all BFST concepts apply to a particular scenario. It simply works well in both directions. Most of the media coverage has centered around the two brothers involved with the bombings: Tamerlan (the older brother) who died in crossfire with the authorities and Dzhokhar, who has plead not-guilty and awaits trial. The parents of the brothers [Anzor (the father) and Zubeidat (the mother)] as well as two uncles [Alvi Tsarnaev and Ruslan Tsarni] have all have been in the media spotlight, giving various explanations for the brothers' actions or denying their involvement. Reported on a much less frequent basis is the fact that the brothers also had two sisters, Bella and Aliina. 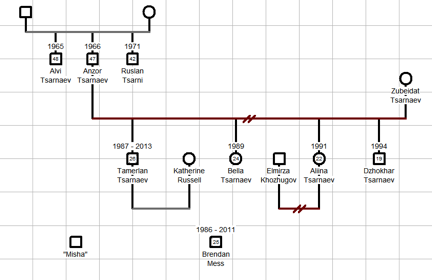 Extended (but not blood-related) members of this family include a mystery man (if he really exists at all) named Misha and Tamerlan's former friend Brendan Mess. 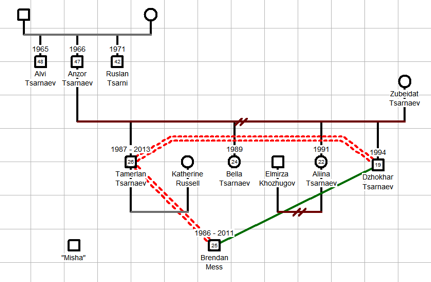 Below is a family diagram showing the various members of the extended Tsarnaev family. While clearly the media has concentrated its focus on the Tsarnaev family, there is at least one other family to consider: the Russell family. Older brother, Tamerlan Tsarnaev, married an American woman named Katherine Russell, the oldest of three sisters and with whom he had a daughter. Katherine's father, Warren, is an emergency room doctor with medical licenses in multiple states while her mother, Judith, has practiced nursing and social work. - Tamerlan appears to have been quite close, i.e. fused, to his mother Zubeidat. Reports vary as to who radicalized whom.2,3 Possibly Tamerlan converted Zubeidat to radical Islam. Very likely the situation was just the reverse—that the mother had the far greater influence over her son than vice versa. - Katherine Russell is a more interesting character to analyze. On the one hand, she clearly broke away from the trappings of her MA-based family's Western material wealth and ideas. One might argue that she was quite the independent thinker and, therefore, quite differentiated. However, she also appears to have fallen under the spell of Tamerlan, had a baby with him and dropped out of school. She claims to have not known anything about her husband's activities, but this notion is a bit difficult to fathom. A more plausible explanation is that she suffered from low self-esteem and was quite low on the scale of differentiation, i.e. closely fused with Tamerlan. One could easily argue that she was probably reacting to her own original family and, as a result, she cut off from them. - The brothers' sisters were both forced into marriages arranged by their mother Zubeidat. Both sisters divorced and moved away to New Jersey; Aliina subsequently moved to New York. One might conjecture that the sisters wanted to distance themselves from their mother's fused (undifferentiated) behavior and might not have been as keen as their mother and brothers to embrace the tenants of Islam. 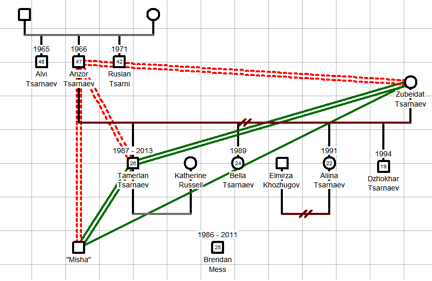 - There's another triangle to look at if we take Anzor, the father, the brothers taken together, and pairing up the brothers' uncles. There was plenty of anxiety moving around this triangle, so much so that it led to one of the family's many cutoffs. - The father, Anzor, not only divorced Zubeidat in 2011, he also cut off relations with this sons after he returned to his homeland of Dagestan to deal with his bout with cancer. - Very shortly after the Boston Marathon bombings, the brother's uncles, Alvi Tsarnaev and Ruslan Tsarni acknowledged that they had not communicated with the brothers for years.8 Alvi told the Journal News (Westchester County, NY), that "his nephew phoned him Thursday night for the first time in two years." He added, "We were not talking for a long time because there were some problems." Without elaborating he added, "We were not happy with each other. "9 Similarly, Uncle Ruslan Tsarni told the media that he "had been estranged from this brother (the father of the brothers) and that he had not seen him or his children in years. 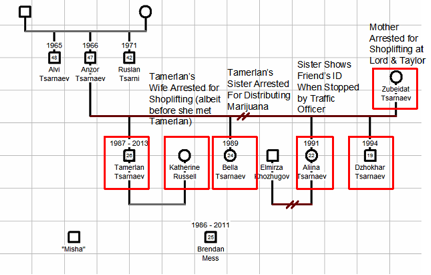 - Katherine Russell, Tamerlan's wife, not only cut off from her parents, but her sisters as well.11 Why this may have occurred might be explained by yet another BFST concept - the family projection process. Of all of the BFST concepts, this one is the most difficult to see in the Boston bombing case, at least from the media reports. A good example, however, might arguably be found in Katherine Russell's family, about which the media seemingly did little research, much less provide coverage. Aside from Katherine Russell's parents being an ER doctor and a nurse, respectively, a deeper investigation into the family provides clues to why Katherine might have removed herself from her family. The Russells are a well-established family with captains of industry and graduates of Ivy League and other highly regarded schools at both the high school and collegiate levels. The media also reported that Warren Russell studied at Phillips Exeter Academy, one of the leading prep schools in the nation, and Yale.12 Warren Russell's father, Richard Russell, also graduated from both Phillips Exeter academy and Yale. Richard Russell did graduate work at MIT and just missed out on an opportunity to participate as a member of the U.S. Olympic crew team. For many years he held the position of President of an engineering firm that continues to operate today. Ironically, given that we are exploring a terrorism case here, Richard Russell was a member of U.S. Army Counter-Intelligence during the 1950s. Going back yet one more generation, Katherine's great-grandfather was also a graduate of MIT and served as General Manager of a steel corporation. The media reported that Katherine Russell graduated at the top of her high school class. She matriculated at Suffolk University where she studied for three years before meeting Tamerlan at a local pub. Shortly thereafter, she became pregnant and dropped out of school. With the history of her paternal ancestral line's success in business and the medical profession, one can only imagine the parents' disappointment, if not alarm, regarding their daughter's behavior. Keep in mind that Katherine's mother worked as a registered nurse and a social worker. One has to wonder not only how much pressure Katherine must have received to be a "success," but also how reactive she became to that stress in a counterproductive, escalating cycle. Collecting information about the various characters in this horrible tragedy, it became clear that the brothers were not the only persons who ran afoul of the law. The brothers' mother, Zubeidat Tsarnaev, was arrested in June 2012 for shoplifting seven dresses valued at $1,624 at Lord & Taylor in Natick, MA and charged with "larceny over $250 and two counts of malicious/wanton damage/defacement to property." Zubeidat skipped bail, leading the local court to issue a warrant for her arrest.13 The Tsarnaev sisters were also arrested, albeit for relatively minor infractions. Media reports indicate that sister Bella was arrested in December, 2012 and charged with possession of and intent to distribute marijuana.14 Years ago, the other sister, Aliina, was stopped by police for not wearing a seat belt while driving.15 She provided the officer with identification for Britney Smith, a friend of the Tsarnaev, rather than her own. Where did all of the siblings get the notion that it is okay to break the law? Mother Zubeidat certainly appears to be one of the best sources. Tamerlan was the oldest of the four Tsarnaev siblings. Given his sibling position, it is not surprising that his two sisters and younger brother looked up to him. He was a leader and certainly Dzhokhar followed almost every word he said. The sisters looked up to him, at least for a long time, before they moved away from New England to New Jersey and New York. Little information can be found about Zubeidat's upbringing and her nuclear family. We do know that, for a long time, she dressed in provocative Western clothing before practicing Islam more devoutly. 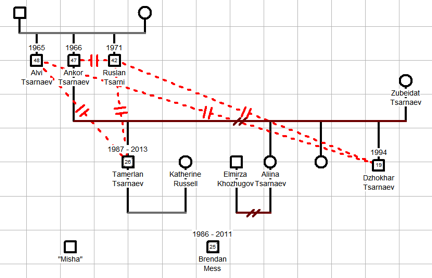 As indicated earlier, Anzor is a middle sibling of three brothers. Sibling position theory might suggest that, as a middle child, Anzor either might have a) felt as the neglected child in his own family or b) acted as a "peacemaker" in his family. In this example, the facts appear to support the former theoretical notion, but not the latter. For whatever reason, including either his behavior or that of his sons, Anzor's brothers cut him off. Furthermore, if he did try to intervene in the affairs of his wife Zubeidat and son Tsarnaev, he clearly failed at these efforts. Until recently, the Boston Marathon bombing case was unique for one to utilize BFST to analyze it for not only the family dynamics, but also to see reactions in the larger society as a whole.2 The public reaction to the question, "What do we do with Tamerlan's body?” caused quite a controversy. No one in Boston or even in the state of Massachusetts wanted his body buried anywhere near the bombing site. The parents were not willing or able to pay for the shipment of the corpse to their homeland in Dagestan in Eastern Europe. Tamerlan's mother, Zubeidat, claims that her husband, Anzor, is too ill to travel to the U.S. to claim the body. Zubeidat risks being arrested on felony charges if and when she steps foot on American soil. Ultimately, Tamerlan's body was buried at the Muslim Al-Barzakh Cemetery in Doswell, Virginia. Both the local authorities and residents of the Doswell community had no idea that the body would be buried in their own back yard. In fact, the burial there caused quite a stir. One resident exclaimed, "He killed Americans on American soil, therefore he shouldn't be buried here." There were societal reactions beyond just the burial of Tamerlan. Vandals attacked a mosque in Oklahoma City shortly after the Boston Marathon bombings. Police suspected this was a "backlash" to the terrorist attack. In the same timeframe, Muslims quickly defended themselves and their religious customs. A Muslim woman in Charlotte, NC told NBC News that, "wearing a headscarf and other traditional Islamic garb in public often leads people to assume she sacrificed her American life to please a man." She continued by saying that she's also "heard people say that her husband is allowed to beat her, that she's not free to get a divorce, that she and her two children, ages four months and two, are subservient to the man." She added, "Such concepts are untrue, of course." The Boston Marathon bombing chase provides an excellent example for showing how all eight of Bowen Family Systems Theory can be applied together. While the media covered the raw facts of the case, they did not use family systems thinking to attempt to understand the Why's of the case. BFST helps to achieve that goal. The case provides a unique opportunity to teach all of the BFST concepts in one simple example. 1. The name of an old Broadway play and an old movie starring Zero Mostel. 4. "Ties that blind? Family connections can be key in journey down terrorism path", NBC News, 25 Apr. 2013. Web. 5. "Who is 'Misha,' the Armenian Muslim who radicalized Tamerlan Tsarnaev? ", The Week, 24 Apr. 2013. Web. 6. "Tamerlan Tsarnaev's Friend & Teacher Misha, the Bombings' Mystery Man", The Daily Beast, 24 Apr. 2013. Web. 16. More recently the Trayvon Martin / George Zimmerman has invigorated the general populous to the extent that U.S. Attorney General Eric Holder has said that he will at least investigate whether or not human rights violations should be filed against Mr. Zimmerman and President Obama has weighed in on the subject, "Years ago, that could have been me."